Stories about Nan and Pop’s Fruit Shop that have appeared in the Media. NAN and Pop’s Online Fruit Shop is a story about how to turn a negative into a positive. 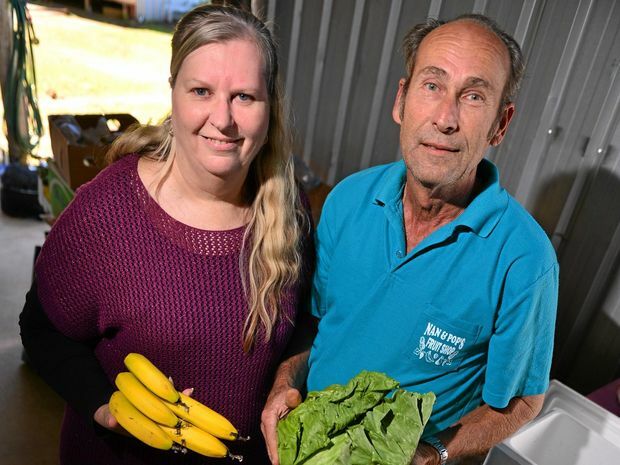 Two years ago, Dawn and Gordon Lindsay went into a fruit and vegetable shop at Landsborough. In Dawn’s words, the business “didn’t go so well” and within months they were reconsidering their future. There was one ray of light: home deliveries. “Home deliveries were going well but all the home deliveries were doing was paying for the rent to keep us in the shop,” she said. Dawn realised there could still run a business if they ran it differently – by doing away with the shop and focusing on home deliveries. “I said this is the way our business is going and we needed to go that way, too,” she said. Running an online business had not been on the radar for Gordon, a man of the land who is not particularly comfortable with computers. But he knew well enough to listen to his wife, who was familiar with social media. “We’ve been married for nearly 38 years. He listens to me and I listen to him and he could see what was happening, ” Dawn said. Nan and Pop’s Online Fruit Shop started with an “off the shelf” website but the Lindsays have upgraded the website to something faster and easier to navigate and use. And the business is booming. From the family property at Peachester, Nan and Pop’s delivers from North Lakes and Deception Bay in the south to north of Peregian Springs. The Lindsays source as much of their product as possibly locally topped up with what they cannot from the markets in Brisbane. While Dawn handles the social media side of things, Gordon is hands on, picking up stock, packing, with help from their daughter, Sharon, and delivering. Dawn said the business was based on great customer service and good quality, fresh produce brought in twice a week. “We’ve got customers saying their stock is lasting two or three weeks. They don’t have to keep going back to Woolworths and Coles to keep buying their produce and they’re saving money,” she said. Gordon handles the deliveries himself, revelling in the face-to-face contact with customers. “Gordon has been a workaholic all of his life and he loves driving and he loves the social aspect of it as as well and the customers love the fact that Gordon stops and has a chat to them,” Dawn said. The success of Nan and Pop’s has given the Lindsays the confidence to invest in the future of their own property and plant for the future. The 12 hectare property was once an avocado farm and the Lindsays have decided to replant with avocados. They have put in 120 trees this year and have plans to plant more. For Gordon, who was part of the Lindsay family who grew bananas and small crops at Buderim, it is a way of continuing the farming legacy for the next generation. The Lindsays’ son, Ashly, is keen on following in their footsteps. “This business is going ahead and we want it to get to the point where our son can come and join us in the business because that’s what he wants to do,” Dawn said.